Bromjunaar Sanctuary is a hidden location that can be reached by equipping the wooden mask. 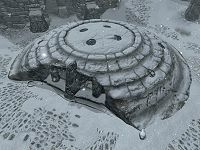 While scouring through Labyrinthian, you might find a skeleton, some notes, and a wooden mask inside one of the snow-buried buildings in the area. Upon reading the notes it is revealed that equipping the wooden mask actually transports you somewhere else—seemingly back in time, before the destruction and subsequent burial of the building. 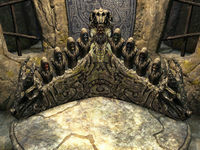 Bromjunaar Sanctuary contains eight pedestals of dragon priests upon which their respective masks can be placed. Placing all eight masks on the statues at the same time will unlock Konahrik's mask, a powerful ninth mask. The other masks can be retrieved after being placed, but any improvements made to them through Smithing will be erased once they leave your inventory. To leave the sanctuary, simply unequip the wooden mask. If the wooden mask is dropped while in Bromjunaar Sanctuary, it will be placed back into your inventory when you return to Labyrinthian. Equipping the wooden mask anywhere else besides the buried building at Labyrinthian will not transport you to Bromjunaar Sanctuary. Likewise, equipping the wooden mask outside the building and then walking in will not transport you, either. Items placed in the sanctuary don't reset, nor do most of the containers. The two urns by the static door, however, are not safe. The books Holdings of Jarl Gjalund and A Minor Maze refer to Bromjunaar as an important settlement in the past. If one of the masks is sold to a merchant, it will become impossible to obtain Konahrik's mask. The mask Nahkriin can only be obtained when in Skuldafn as part of the main quest. If you fail to retrieve it, you will not get a second chance to obtain it. The mask Morokei can only be obtained from a sealed area of Labyrinthian. Normally it is obtained during the College of Winterhold quest The Staff of Magnus, but it is possible to return later to Labyrinthian if the mask was left behind. It is not possible to unseal the area containing Morokei without joining the College of Winterhold and completing much of its questline. It is possible to get a horse into the sanctuary, but equipping the wooden mask while on horseback causes the game to crash. This page was last modified on 3 March 2017, at 14:17.